A Twitter Takeover has commenced at Hull Kingston Rovers. Iain Thornley, starting centre for Rovers, took your questions Monday afternoon via Facebook and Twitter as Brian Alfred hosted a #BAFanZone question and answer session. Thornley, a former England Academy and England Knights international, was the prize acquisition prior to the 2016 season after strong campaigns at Wigan Warriors. Thornley’s skills on the edges helped Wigan to their double-winning campaign of the Challenge cup and the Grand Final in 2013. 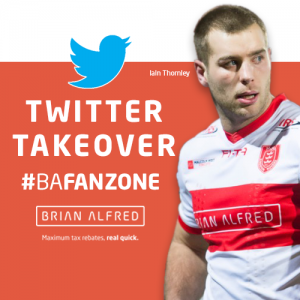 Using the official Hashtag #BAFanZone, Brian Alfred – the principal club sponsor for Hull Kingston Rovers – encouraged fan participation in the takeover via social media channels, all leading up to several events we’ll be taking part in over the next few days. We’ll be meeting up with Hull KR fans on Friday 1st July for their showdown against Warrington Wolves in a First Utility Super League clash at KC Lightstream Stadium. Kickoff is at 8pm, and we’re giving away two free tickets. To enter, just send across a snap of you in your Hull KR shirt using #BAFanZone onto Facebook or Twitter. Also, keep your eyes peeled for our official “Try” signs on game night.